It is quite a paradox that the things we strive for in life are the things that can stifle our growth. The endless pursuit for success is driven by our need for comfort, security and certainty. More success is equated to more comfort, which is very true in one aspect. There isn’t anything inherently wrong with wanting more comfort in life because when we’re comfortable, with our basic needs met, we’re more likely to be creative. Creativity can lead to new and better results, which in turn, can provide more comfort and certainty. The concern is once we get too comfortable, it can cause us to not challenge ourselves. When we’re uncomfortable, that’s when we’re really tested. 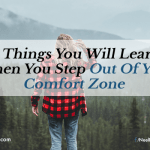 It’s important to know how and why discomfort has an effect on us because we tend to grow in many aspects when we’re outside our comfort zone. If we’re not growing as a person, part of us will feel stagnant, lacking direction or purpose, and it can also affect our level of thinking and our emotions. These all have an effect on the types of results we achieve. One of my mentors once said, “Most people are tiptoeing through life hoping to get to death safely.” That is a dumb game to be playing because we experience life fully when we’re challenging ourselves to grow in some capacity. Many years ago, while I still had a corporate career, I really admired people who could speak well in public. The way they held the attention of their audience, their gestures and body language, how they changed the tonality of their voice to keep their audience engaged, all fascinated me. I wondered if I could ever be able to speak in public. This new desire was forming inside of me but deep down, I was absolutely petrified to speak in front of an audience. Fortunately, my corporate role gave me some practice speaking in front of groups which slowly built up my confidence. I then started speaking at Rotary Clubs, Lions Clubs and networking meetings where I continued to improve my speaking skills and experienced some success as a speaker. My next challenge was to acquire some formal training in speaking and becoming a better trainer, so I attended numerous training programs, locally and internationally, which was another source of discomfort. As a result of allowing myself to be uncomfortable, I have been able to speak to hundreds of people internationally, including speaking on a TEDx stage. Being comfortable speaking in front of hundreds of people is something I developed over time. My next level of discomfort will be speaking in front of thousands or tens of thousands of people, which will take me to a whole new level as a speaker. 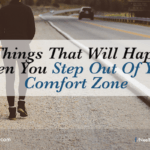 Here are five ways experiencing discomfort can support us in our personal growth so that we can continue to improve ourselves, be the best we can be and achieve the results we want in life. Discomfort is a sign of life. When we experience discomfort, which is another way of describing challenges or problems, it is evidence that something different is happening in our lives. The only people who do not have problems are those who have deceased. Not matter how successful we are, we will always have challenges. A lack of discomfort means we are not growing, and one of the laws of the universe states that everything is in a constant state of change. Nothing stays the same. Therefore, if we’re not growing in some capacity, by law, it means part of us is dying. Discomfort tests what we are made of. Abraham Maslow once said, “We will either step forward into growth or we will step back into safety.” When we experience discomfort, we can either face it head-on, or we can allow it to hinder our progress or take us off course. We can either continue moving toward what we want or we can retreat into our comfort or familiar zone. Oftentimes, when we do achieve something significant in life, the feeling of achievement is much more gratifying if we’ve overcome obstacles than if we achieved it relatively comfortably. Progress only occurs after we overcome some discomfort. When we do any physical exercise, we make progress only after we’ve put ourselves through some form of discomfort. If we want to build muscles, we have to put our body under stress first in order to do so. Similarly, if we want to grow as a person, we must be willing to get uncomfortable. There is a saying in the personal development industry — we must be comfortable being uncomfortable. We must learn to honour our struggle because our struggle can lay the path for someone else to learn from our struggle. Every challenge we face can be valuable if we’re willing to look for the lessons from each of those challenges. Discomfort forces us to tap into resources within us. It is very common for people to admit they did not know how they would overcome a particular challenge they were facing but somehow they managed to. This is because every time we are challenged, we are forced to do something about it. Those who are willing to face their challenges often access internal resources they did not know existed within them. The coaching industry has been built on the premise that a person always has the answers to their challenges, they just need guidance on how to tap into parts of themselves that can come up with the answers. This is why when we’re facing any form of discomfort, asking better questions about the issue will always give a better answer. Discomfort allows us to have new experiences. There can also be excitement associated with discomfort. Think of going on a trip to a place you’ve never been before or doing a physical activity that is way beyond your comfort zone like a parachute jump. That discomfort opens the way for us to have a new experience and enjoy life more. Happiness comes from knowing we are making progress in life. It is very rare for anyone to feel a great deal of joy if they’re feeling stagnant. If we’re not experiencing discomfort on a regular basis, it means we’ve become comfortable with what we are doing or how we are living our lives. It’s a sign that we may have plateaued and there is usually one direction after that — downwards. Our aim should be to experience as much discomfort as we can without putting ourselves at risk physically, financially, emotionally and relationally. Action Step: Answer this question: When was the last time you did something for the first time? Start planning for more first time experiences that will cause you to go outside of your comfort zone and have new experiences in life. Question: How do you currently deal with discomfort? Oh yes, this is so! 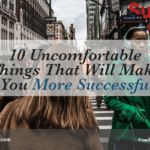 And sometimes, experiencing success can create a different kind of discomfort, which leads some people to sabotage themselves back into failure. Always good to know the boundaries of our own comfort zones. Great post, Neel! That’s a good point Jane! 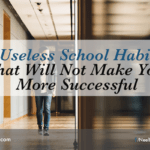 Success sabotage is something we all should be aware of. Thanks for your comment!